The Cider House Pavilion at Lawrence Orchards! We opened up the walls of the cider house into a pavilion. It has 3 open walls, a roof over head and a sturdy end wall to protect you from the weather. The Cider House Pavilion is filled with fun items from the past and touches of elegance. 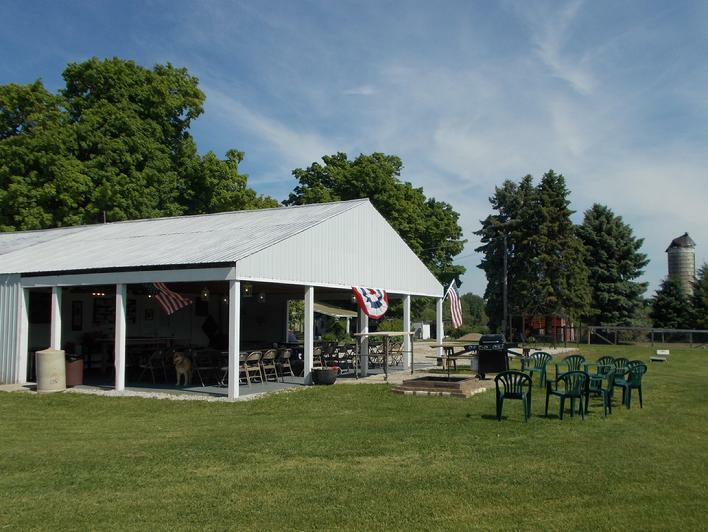 We rent our pavilion to parties that need a roof over head for their gathering. We offer seating for up to 50 people ( five 8' tables and 50 chairs). There is room for up to 75 when the picnic tables are used. We have serving tables,a refrigerator with freezer, electricity, and cold running water all included in the rental fee. Plenty of close off street parking . Fully accessible. There is a gas grill, fire pit with a grill if needed and marshmallow sticks!. 3.5 gallon beverage dispensers (2), hayride, apple train, and other extras available. Check out the Particulars, Our Facilities, and pictures of some of our Gatherings. We have hosted so many gatherings that it is hard to count. Let us know when you want to reserve your gathering for this year. The Cider House Pavilion is available for rent from late April until early November.